This is the first (and last) time in history that an entire people would see what is normally only heard. They were seeing unbelievable things and it scared them stiff. How did they respond? They told Moses, “We need you to be the buffer between us and God, because if we hear Him anymore we will die!” They had an extreme fear of the very One who had delivered them from Egypt. This brings us to an important question. 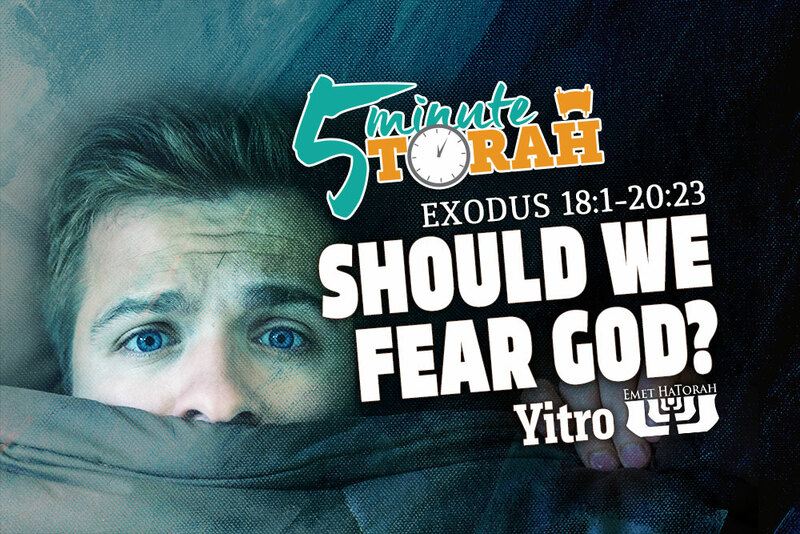 Should we fear God? Many people quote the words of John, “There is no fear in love, but perfect love casts out fear. For fear has to do with punishment, and whoever fears has not been perfected in love” (1 John 4:18). They say that followers of Yeshua should not fear God. However, Yeshua told his disciples, “Do not fear those who kill the body but cannot kill the soul. Rather fear him who can destroy both soul and body in hell” (Matthew 10:28). The fear of the LORD should be properly placed. How does this work? Let’s look at an example from the midrash. King Solomon was the wisest of all men, but yet he fell prey to sin. How so? The midrash tell us that when he was writing his copy of the Torah, as all kings are required to do, he altered the text to permit himself to disobey the commandment prohibiting a king from having too many wives. The commandment of the Torah reads, “And he shall not acquire many wives for himself, lest his heart turn away” (Deuteronomy 17:17). Why did he do this? Solomon believed he understood the reason the Torah gave the commandment (that his heart not go astray) and consequently thought his superior wisdom would keep him from being entangled in this particular sin. In other words, his wisdom took precedence of his fear of sin. Therefore, his wisdom failed and he ended up exactly where he believed he would not. Fear of God is a trait that requires extreme balance in a person’s life. If we throw it out completely we will end up like Solomon, in a place we never dreamed we would be. However, we can also have a fear of God that cripples us like the Israelites at Mount Sinai. The middle road is the path Moses took. He knew that a healthy dose of the fear of the LORD is a deterrent to sin and would put us into a right relationship with our Redeemer. The fear of God, or lack thereof, can either cripple us, misguide us, or empower us. May we all have a healthy dose of the fear of the LORD that empowers us to overcome sin and gain wisdom from our Redeemer.